Excitement and anticipation filled the air once Lady Gaga’s bad romance blared from the speakers. You could see heads bopping and necks stretching to see the first celebrity-Pushing Daisies star Kristin Chenowith walk down the runway in her Swarovski gown. As the celebrities walked down the runway, a large screened displayed their names and the designer dress they were wearing. American Idol winner Jordin Sparks and Cosby show alum Raven Symone were giving major diva attitude as they sashayed down the runway with their curvaceous hips swinging left to right. At the end of her walk, Raven Symone tossed her head back and kicked off her shoes into the crowd before she left the runway. One of the most surprising celebrities to see was Bethany Frankel from Bravos Real Housewives of New York, gracing the runway with her pregnant belly in tow. As she was walking, her dress kept riding up her leg and the audience got a peek at her undergarments. The second most surprising moment of the night was seeing true diva, Joan Collins gracefully walk down the runway as the crowd cheered in admiration. No strangers to the runway, and new moms, Heidi Klum and Kimora Lee both looked great after just having babies. Kimora wore a strapless knee length dress from her new Kouture collection and Heidi’s gown was designed by John Galliano. Kim Kardashian showed off her curves in a Marchesa one shoulder gown and singer Estelle gave a bashful smile in Zac Posen. My favorite celebrity of the night was Regina King who showed the runway who was boss with her bold and sassy walk in a fitted ruched mini dress. As the show came to an end, a shower of red confetti fell from the ceiling while all the beautiful celebrities came back out for their final walk. 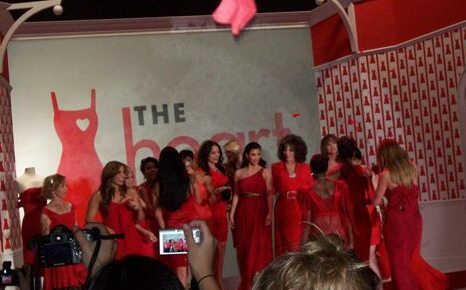 It was nice to see these powerful celebrity women wearing their red dresses with pride- knowing that the message they are sending will save lives.